If you are looking for organizational tips that work then you might be wasting your time and money, on the other hand they might work. The problem is, everyone is different, what works for one doesn’t mean that it will work for the next person; it depends on a lot of different factors. The most important thing when you are looking for organizational tips is you understand that they aren’t necessarily all going to work for you. For this reason I don’t recommend spending money on something that might just sit and collect dust. If you are able to translate some of the tips so they are more likely to work for your own circumstances. You just have to find your own way of doing things and understanding of how clean and organized your home is. Declutter is a fine example of a concept that you can work into your home and life, but what you do might be completely different from the next person, but that is OK if you are happy with the results. Often the term seems to apply to an item that doesn’t belong or you have too many of the same or similar item. However, how you interpret this into your own home will be personal. You might see every item not in its place as clutter, but you can also consider clutter as items that you no longer use or enjoy on a regular basis. Closet organization is another one of those areas that can take on new meanings, depending on the person doing the organizing. For some people, coat hangers are a certain distance apart; clothing must go in certain places and even on certain coat hangers. However, if you are happy that all clothes are off the floor and you can see what you own, then this is perfectly fine. Garage organization is typically an area where items are left when they don’t have a home of their own, as well as housing items that belong there. While a dream would be to have the perfectly clean and organized garage, in reality, this just isn’t going to happen, but I am perfectly happy as long as I don’t buy something because the original is lost. Getting a system in place is going to help prevent you from becoming overwhelmed with getting organized. Understanding that it is going to take time and perhaps a couple of false starts, until you get into the habit will help you to continue with your quest to become organized. 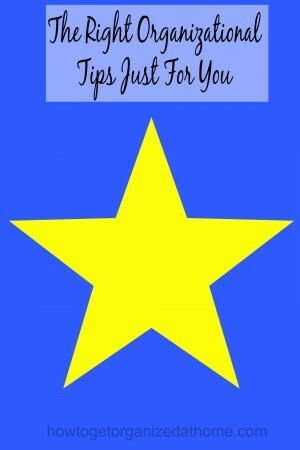 So, if you are looking for organization tips that are going to help you succeed, then don’t be afraid to change them so they work for you and meet your needs. They are there to give you ideas, so you can see different approaches to the same problem and in among these you will find or adapt an idea that suits you, solving the organizational problem that you have. Therefore, don’t think that every organizational tip is going to work for you, you need to feel that it is OK to change things and to develop your own version of an idea, so that it fits in with your needs and does the job you hoped for. I’m generally not afraid to try new things, and stop if they don’t work for me. I just can’t spend any money doing it! It is the money thing for me too!